Thinking about moving to China? The Middle Kingdom is a Beijing blog devoted to providing truly helpful information about expat life, work and travel hacking in China. 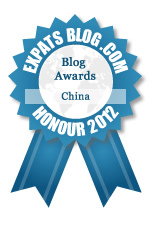 ExpatsBlog.com Expat Blog Awards 2012: China Honourable Mention Award! This blog won the Honourable Mention Award for best expat blog in China! Excellent blog. Especially the Medical exam blog, thank you so much for that. I have lived in Beijing for about 12 years and I always send "newbies" to this blog to help them get settled here. I also have learned new things about my city and look forward to new blog entries. The only place I know that has great, up-to-date, practical information about "real life" as an expat in China. A fantastic resource for both old china hands and people fresh off the plane. The writers successfully blend tips tricks and stories that illustrate the reality of expat life and inform the decisions of those embarking on the adventure for the first time.